1,000 Origami Paper Cranes: Why Make a Senbazuru? What is a senbazuru in Japanese tradition? What if you could have one wish? What would it be? According to Japanese tradition, folding 1,000 paper cranes gives you a chance to make one special wish come true. In some variations of the tradition, you may be granted happiness and eternal good luck, instead of just one wish, such as long life or recovery from illness or injury. The crane is an auspicious creature in Japanese folklore (the dragon and tortoise, too). The crane is said to live for 1,000 years and is the significance behind the quantity you need to fold. 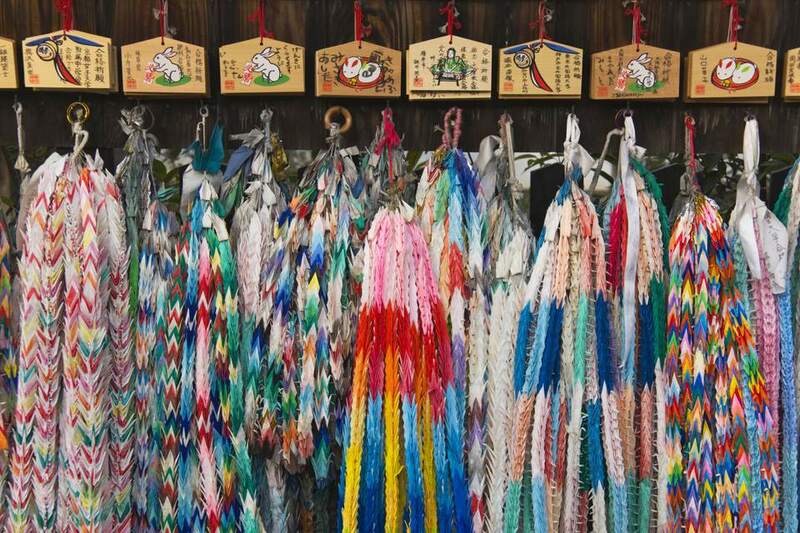 Some believe that one person must fold 1,000 cranes within one year in order to get the blessings of that wish. Origami cranes (orizuru) that are folded into a group of 1,000 are known as a senbazuru. "Sen" means "thousand" in Japanese. The individual cranes are often strung along a string so they can be hung from the ceiling. The cranes are typically made from many different colors and patterns of paper, so they are a bright and cheerful decoration. As you might expect, folding 1,000 paper cranes is not an easy project. Origami cranes get easier to fold with practice, but making 1,000 paper cranes is still a huge undertaking. For this reason, it is common for groups of people to join together to make a senbazuru. And, because this activity brings people together, the act of making a senbazuru has been adapted on a larger scale to spread public awareness often for good causes or charitable fundraising campaigns. The 1,000 origami cranes may be a folkloric Japanese tradition, but it was popularized and spread throughout the world through the story of Sadako Sasaki. Sasaki was a Japanese girl that suffered radiation poisoning at the age of 2 when the atomic bomb was dropped at Hiroshima during World War II. She developed leukemia at age 12. Inspired by the senbazuru legend, she began folding cranes. She completed 644, but sadly, was too ill to finish. She died that year. Her family and classmates completed the senbazuru in her honor. Sasaki is remembered today as a worldwide symbol of the innocent children impacted by war. The International Campaign to Abolish Nuclear Weapons uses the idea of folding 1,000 paper cranes in its public awareness campaigns. The organization tells the story of Sasaki. Her story is told in greater detail in the children's book "Sadako and the Thousand Paper Cranes" by Eleanor Coerr. The book is commonly read in elementary schools as part of the peace education curriculum. One of the most popular reasons for people folding 1,000 paper cranes is to show their support for a loved one suffering from a serious illness. 1,000 Cranes of Hope is a cancer awareness campaign. This online resource can show you how to make a senbazuru. There are downloadable PDF crane instructions, as well as many different video tutorials. The project is sponsored by Millennium: The Takeda Oncology Company, an organization that will make a charitable donation for every wish made on the site. The goal is to unite people from around the world in the fight against cancer by making an "interactive online monument" to the men, women, and children struggling with this deadly illness. Cranes for Cancer is an organization that collects cranes from schools and online donations and delivers 1,000 cranes to people who have cancer. Often individual patients are in great need of a show of support as they undergo chemotherapy treatments. You can nominate a patient to receive cranes by sending an email to the organization. The concept of folding 1,000 paper cranes is sometimes used to raise awareness about the needs of people recovering from natural disasters. For example in 2011, several high schools across the United States sponsored fundraisers where each of the senbazurus were sold to raise money for the 2011 tsunami victims in Japan. Boy Scout and Girl Scout troops also completed this project. Folding origami cranes can be a way to express your commitment to wildlife conservation. The International Crane Foundation works to conserve cranes and the wetland and grassland ecosystems they need to survive. They sponsor a 1,000 cranes campaign to help raise awareness of the importance of saving these beautiful birds.